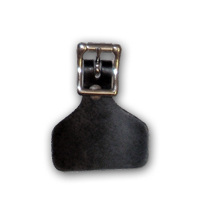 These are high quality leather leg pad straps. They are 34" long and are made to slide through the pad (boot or shin) and have a buckle on the end. This is a high quality sew in mushroom ended strap. These come in 20", 22", 24", and 28"
This is a high quality sew in mushroom ended buckle to use with the above sew in straps. We stock as many types and colors of straps as we can but sometimes stock runs low so please inquire about the wait time on any leather item. Any speciality items like gold buckles, flared end straps and buckles, double buckles, removable buckles, or different lengths then we normally stock will have a wait time since they are special order.. This jenpro pocket holds a leather mushroom ended strap in place. Simply sew this into your pads instead of the strap to make the job easier and the strap removable! These nylon straps are made to order to fit your pads. 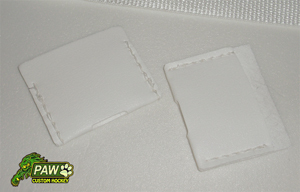 If you need a velcro patch on the end or just a slick clip, we can do it! Meant to replace leather or worn straps, this system has what you need to be able to install and change the straps quickly. Simply sew in the loops to the sides of the pads and the quick change system allows for easy installation and replacement. 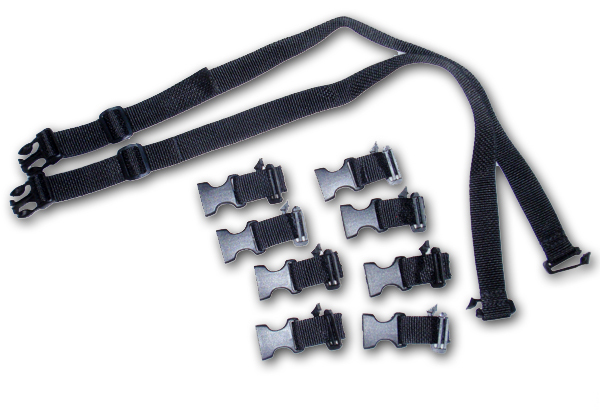 Each strap comes with all the parts seen here.